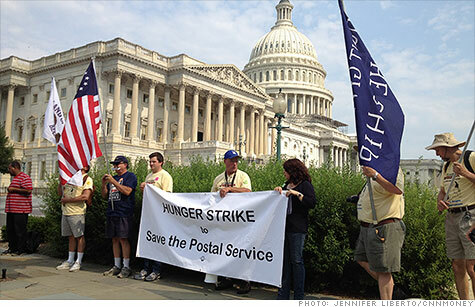 Postal workers begin a hunger strike Monday outside the Capitol. They're protesting cuts that could eliminate thousands of jobs. WASHINGTON (CNNMoney) -- Ten current and former postal workers launched a more than 3-day hunger strike Monday to protest looming cuts and closures at the U.S. Postal Service. Drastic? Yes. But organizers say desperate times call for desperate measures. "Rallies and marches just aren't working anymore," said Tom Dodge, 58, a postal truck driver from the Baltimore area who has participated in several marches and rallies to save post offices. "It's time to take a stand on this. The post office is a part of our Constitution." The hunger strikers want the Postal Service to shelve its July plans to start closing or consolidating 48 mail processing plants. By the end of 2014, when the plan to shrink the postal network is completed, 229 plants will be consolidated or closed and 28,000 jobs will be gone. They also want Congress to eliminate a mandate that has been a major financial drag on the service -- annual $5.5 billion payments to prefund health care benefits for future retirees. The strikers say say eliminating the mandate would solve the Postal Service's financial problems. "That payment is causing great hardship to the Postal Service," said Nannette Corley, a Maryland mail clerk for the past 19 years who is taking unpaid leave to join the hunger strike. "We are the people. What is it that Congress wants us to do? Starve and make everybody homeless?" The hunger strikers stopped eating Monday and will start eating again Thursday evening. They plan to demonstrate several times in Washington over the next week -- at the Capitol, in front of the Postal Service headquarters, and in front of the offices of the Washington Post. They're also going to knock on doors in Congress to lobby lawmakers to take up a bill that would repeal the prefunding mandate and avoid deeper cuts at the agency. The Postal Service continues to face major financial turmoil. It reported a $5.1 billion loss last year, citing the recession, declining mail volume and a the congressional mandate to prefund retirement health care benefits for future retirees. In addition to the plant closures, which will ultimately slow the delivery of the first-class mail that most Americans use, the Postal Service is trimming staff. It offered buyouts and retirement packages to 21,000 postmasters as well as 45,000 mail handlers who sort and transport mail. The health care mandate is a major liability for the Postal Service. Officials have said they won't have the cash to make a $5.5 billion payment that's due Aug. 1, or the $5.6 billion payment due Sept. 30. While hunger strikers and unions say the health care prefunding mandate is causing the bulk of the Postal Service's financial woes, Postmaster General Patrick Donahoe said earlier this month that those who say the prefunding mandate is the agency's only problem are "entirely wrong." Hunger strikers say Donahoe is wrong. The Postal Service released a statement saying the agency "respects the right of our employees and retirees to engage in lawful public dialogue regarding postal issues." The statement added that the Postal Service also wants to Congress to help them enact its more "comprehensive," five-year, cost-cutting plan -- which includes getting rid of the prefunding mandate as well as the plant consolidations about to take place. The hunger strikers, while members of postal unions that are also fighting the closures, are acting independently of the unions -- although the American Postal Workers Union says it understands the frustration leading to the action. Hunger strikers call their group Community and Postal Workers United. "I'm 63 and diabetic, but this is so important to me," said Jamie Partridge, a Portland, Ore.-based retired letter carrier and one of the organizers of the group. "I'm willing to engage in my health to make an impression on our decision makers."